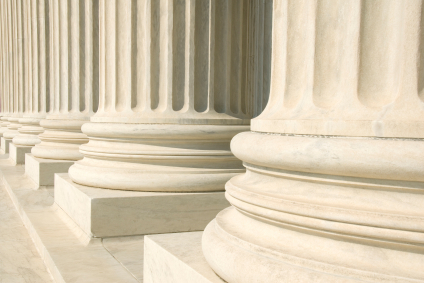 US Supreme Court – Columns | Mark Szaflarski, P.C. A row of columns at the entrance to the US Supreme Court in Washington, DC. The Court was established in 1789 and initially met in New York City. When the national capital moved to Philadelphia, the Court moved with it, before moving to the permanent capital of Washington, DC, in 1800. Congress lent the Court space in the new Capitol building, and it was to change its meeting place several more times over the next century, even convening for a short period in a private house after the British set fire to the Capitol during the War of 1812. The classical Corinthian architectural style was chosen to harmonize with nearby congressional buildings, and the scale of the massive marble building reflects the significance and dignity of the judiciary as a co-equal, independent branch of government. The main entrance is on the west side, facing the Capitol. On either side of the main steps are figures sculpted by James Earle Fraser. On the left is the female Contemplation of Justice. On the right is the male Guardian or Authority of Law. On the architrave above the pediment is the motto “Equal Justice under Law.” Capping the entrance is a group representing Liberty Enthroned, guarded by Order and Authority, sculpted by Robert Aitken. The interior of the building is equally filled with symbolic ornamentation. The main corridor is known as the Great Hall and contains double rows of marble columns and busts of all former chief justices. At its east end, oak doors open into the Court Chamber, where the justices preside. Most of the second floor is devoted to office space. The library occupies the third floor and has a collection of more than 450,000 volumes. The Supreme Court consists of the Chief Justice of the United States and eight Associate Justices. The term of the Court begins on the first Monday in October and lasts for the full year. Approximately 8,000 petitions are filed with the Court each term. A further 1,200 applications of various kinds are filed that can be acted upon by a single justice. The Supreme Court has appellate jurisdiction except “in all Cases affecting Ambassadors, other public ministers and Consuls, and those in which a State shall be Party” (Constitution, art. III, §2), for which it has original jurisdiction. Congress has also from time to time conferred on the Supreme Court the power to prescribe rules of procedure to be followed by the lower courts.